59% of people responsible for IT in Polish companies believes that the implementation of IT monitoring tools would improve the security level in their organizations. WHAT ARE THE BENEFITS OF THE NETWORK MODULE? ITAM (IT Asset Management) is a term used to define the business practices which enable the easier management of IT costs within an organization. 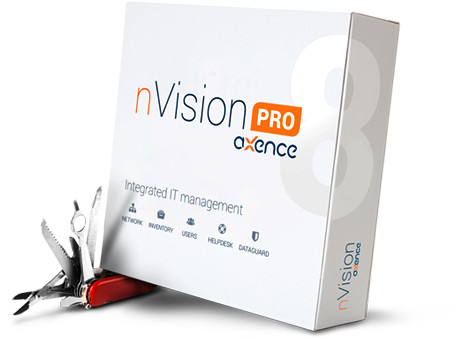 Axence nVision Pro is a key to the efficient management of corporate IT resources. 51% of software installed on corporate machines in 2013 were unlicensed copies. This is often not the result of the bad intent of companies, but rather of the incorrect management of IT licenses and resources. WHAT ARE THE BENEFITS OF THE INVENTORY MODULE? Phishing - use of Internet access at work for private purposes. Cyberslacking - adopting the identity of co-workers to hack into the corporate network. Human - the weakest link in each corporate IT security system. IT event – each, even the slightest event which has an impact on the optimal operation of the IT infrastructure. Most events can be counteracted, but there are some unavoidable incidents which have the potential to disrupt the operation of the entire organization. To remedy such situations in a quick manner, you need technical support service. 32% of all IT events is related to the human factor, where 6% pertains to configuration errors, and the remaining 26% to other employee errors. 70% of companies neglect the need of regular software updates, thus increasing the risk of an attack on the corporate network. BYOD (ang. Bring Your Own Device) – a trend involving the use of private devices at work, described by IT managers as one of the main challenges for network administrators today. 69% of Poles declares that they often use private mobile devices for professional purposes. Every fifth person is ready to break the corporate security policy to do so. 64% of companies cannot be sure, where their confidential data are located, and more than half of them worries that the data can be stolen by temporary workers. Get Axence nVision PRO NOW!